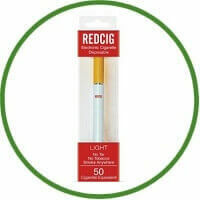 REDCIG offers a simple electronic cigarette great for beginners. Their starter kit has everything you need to get started without the complications of other brands who offer more hardware and e Liquid options. The starter kit includes one battery, two cartomizers, and one USB charger. You receive one Tobacco Light (6mg of nicotine) cartomizer and one Tobacco (11mg) cartomizer with the kit. The ultimate kit includes three batteries, sixteen cartomizers, three USB chargers, and two UK wall chargers. Three of the cartomizers are Tobacco Light, three are Tobacco, and the remaining ten come in two packs of five in a flavour of your choice. REDCIG also sells disposable eC igs at around $11.58 each. 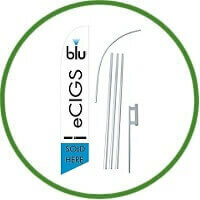 The disposable eCigs are available in Tobacco Light (6mg), Tobacco (11mg) and Menthol (11mg). The selection on REDCIG’s website is pretty basic. Their starter kits are comparable to most other brands on the market and they offer eight flavours for their cartomizers. While it’s hard to compare their prices to other brands in the US, I am more familiar with, I would have to say that their prices are a little higher than I would expect. Whether this is a reflection of the currency exchange or the value of the US dollar, I can’t honestly say. You can find US brands who offer similar starter kits and products for a cheaper price. REDCIG’s design is simple and the packing is nothing fancy. The kit comes in a box that is the same size as a pack of cigarettes, which is convenient to carry with you. The vapour production for these e Cigs is average for the size of battery. While it’s not a huge vapour cloud, it’s enough to blow smoke rings. The battery lasts most of the day after charging overnight. They do offer the larger kits with more than one battery if you would be concerned about your battery dying. REDCIG has eight flavours in total. For example, both the Light Tobacco and the regular Tobacco flavours are the same with the only difference being the amount of nicotine. REDCIG offers a simple electronic cigarette great for beginners. Their starter kit has everything you need to get started without the complications of other brands who offer more hardware and e Liquid options. The prices are more reasonable for those who live in the UK than US residents.